Microids has sent out a friendly reminder to all Nintendo Switch collectors about their upcoming physical releases in Europe. 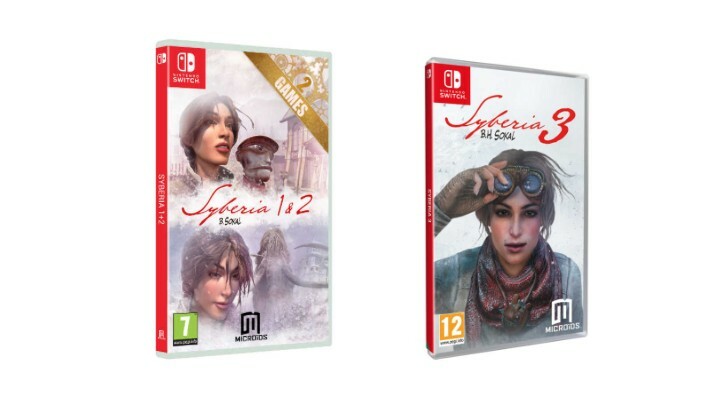 Syberia 3 will be out at retail on October 18, 2018, while Syberia 1+2 will be sold in a package on November 8. All three games are currently available via Nintendo eShop. Check out the details on both games below. Benoît Sokal’s enchanted world will be available on Nintendo Switch tomorrow, with the release of Syberia 3 and Syberia 1+2 on November 8. Players will be able to discover or rediscover all of Kate Walker’s adventures in handheld mode as she goes in search of the last mammoths and the mysterious island of Syberia and accompanies the migration of snow ostriches through sacred steppes. Kate Walker, a young lawyer from New York, is sent to France to handle the sale of a former automaton factory in the Alps. She’s quickly caught up in a journey to the further corners of Eastern Europe, alongside a truly unique automaton called Oscar. Together, they discover incredible places and colorful people on their journey to find Hans Voralberg, the genius inventor who has gone in search of the last mammoths on the mythical island of Syberia: the last piece of the puzzle for Kate to be able to complete the sale of the factory. Having accomplished the ultimate goal of her trip by getting Hans Voralberg’s signature, thus completing the sale of the factory, Kate decides to give up her perfect life in New York to help turn the old man’s dream into a reality. Together, the very special team of Kate and the eccentric Hans Voralberg, accompanied by Oscar the automaton, set off for another trip. Their goal will be to find the last legendary mammoths of Syberia, in the heart of a forgotten world. As Kate Walker, players accompany the Youkol tribe during the migration of the snow ostriches. Together, they make their way through Benoît Sokal’s enchanted world, pursuing common enemies and encountering unexpected obstacles. Syberia 3 on Nintendo Switch also includes the DLC ‘An Automaton with a Plan’, an adventure in which players play as Oscar, discovering a whole new part of Kate Walker’s journey.